I'd love a remake like this with extras and such. 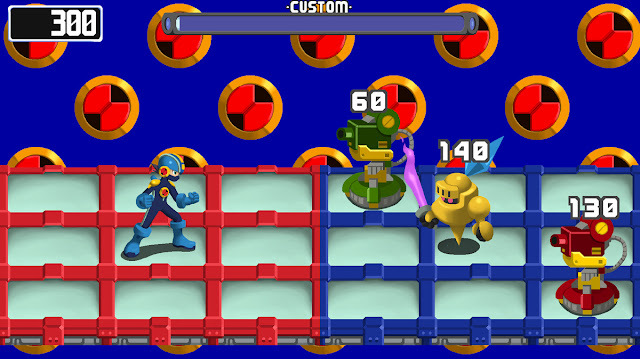 I always dreamt of an extra scenario where you play as Chaud and Proto Man and play their side of BN1. Then Mayl and Roll in BN2, and Bass in BN3. Shame that the chances of it happening are probably zero. Fans never cease to impress me. I hope this does actually turn into a full project namely because being a huge fan of the MegaMan Battle Network series I would love to see an HD remake of the 1st game come to life. Looks a bit weird since its was from gba era but i could totally back up something like this for the 3ds or other. sigh someday megaman someday youll get the recognition you deserve. It looks sick as hell in screenshot form I'll tell you that off the bat right away. Neat idea. It will be interesting to see if the project gets completed. My only critique is that gradients make the whole thing look a little too soft/blurry IMO. I think that it would be a little more stylistic if it was cel-shaded like Network Transmission. Other than that, nice work. I came here just to make a comment about AM2R, but you beat me to it. Pro-tip: Don't recreate an existing game. Either make something brand new a la MMX: Corruption or make an "inspired" game that heavily borrows elements but has a new identity (...just not like MN9). Making a recreation of BN1 is asking for a C&D.